USS LIONFISH was one of the BALAO - class submarines and the first ship in the Navy named after the scorpaenoid fish found in the West Indies and the the tropical Pacific. Stricken from the Navy list on December 20, 1971, the LIONFISH was transfered to Battleship Cove, Fall River, MA., on August 30, 1972, where she is now preserved as a museum. Click here for a photo tour of the preserved LIONFISH. Builder: Cramp Shipbuilding Corp., Philadelphia, Penn. This section contains the names of sailors who served aboard USS LIONFISH. It is no official listing but contains the names of sailors who submitted their information. Click here to see which USS LIONFISH memorabilia are currently for sale on ebay. USS LIONFISH was laid down 15 December 1942 by Cramp Shipbuilding Corp., Philadelphia, Pa.; launched 7 November 1943; sponsored by Mrs. Harold C. Train; and commissioned 1 November 1944, Lt. Comdr. Edward D. Spruance - son of Admiral Raymond Ames Spruance - in command. After shakedown off New England, LIONFISH headed for the Pacific Ocean 8 January 1945, touched at Key West, Fla., and arrived Pearl Harbor 25 February. The submarine departed on her first war patrol 19 March, touched at Saipan, and headed for an area south of Bungo Suido, arriving 1 April. On 11 April LIONFISH evaded two torpedoes fired at her by an enemy submarine, and on 1 May, while patrolling in the Yellow Sea, she fired her guns at a Japanese schooner, leaving her in a mass of flames. Later that day she took up lifeguard duty off Shanghai, China, until 9 May when she rendezvoused with submarine RAY, took on board B-29 survivors, and headed for Saipan, arriving 15 May. After discharging her passengers and topping with fuel she headed for Midway, arriving 22 May. Action bound once more, the submarine sailed 20 June 1945, Comdr. B. M. Ganyard in command, for Bungo Suido. On 10 July she sighted and fired upon an I-class enemy submarine. When LIONFISH reached periscope depth she saw only a cloud of smoke in the direction of her target. Shortly after, LIONFISH�s crew heard loud breaking-up noises and assumed the submarine had been sunk, although this could not be confirmed from postwar records. LIONFISH exhausted her supply of torpedoes in unsuccessful attacks on two other enemy submarines and headed for lifeguard duty until 18 July when she steered for port, arriving Saipan 21 July. Torpedoes loaded and refueling completed LIONFISH departed next day for lifeguard duty off the Nansei Shoto and Honshu, Japan. She remained in this area until hostilities ended 15 August, then headed for Midway, arriving 22 August. Eight days later LIONFISH departed for the west coast, arriving Mare Island Navy Yard 11 September 1945, where she decommissioned 16 January 1946 and entered the Pacific Reserve Fleet. LIONFISH recommissioned 31 January 1951, Lt. Comdr. Arthur G. McIntyre in command. Following shakedown and operations along the California coast the submarine departed San Diego 5 April for the east coast via the Panama Canal, arriving Key West, Fla., 21 April. She served as training ship for the Sonar School until 11 June 1951, when she departed for her new home port, New London, arriving 16 June. She served as training ship and operated out of New London until 25 September when she sailed for training out of Guantanamo Bay, until returning New London 31 October for overhaul and Boston and coastwise training. On 7 July 1952 the submarine began a cruise to Bermuda and Nassau, returning New London 7 August. She sailed 18 October for a Mediterranean cruise, during which she visited Malta and, after participating in NATO exercises, Izmir, Phaleron, Taranto, and Naples. LIONFISH headed for the United States 12 December and arrived New London 27 December. On 30 June 1953 the submarine arrived in Boston Naval Shipyard for deactivation. She was towed to New London 3 November, decommissioned there 15 December 1953, and joined the Atlantic Reserve Fleet. 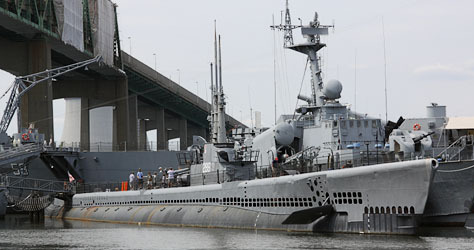 LIONFISH was placed in service in reserve 1 March 1960, towed to Providence, R.I., and moored at the Naval and Marine Corps Reserve Pier serving as a reserve training submarine. 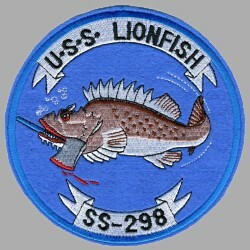 Reclassified AGSS 298 in December 1962, LIONFISH was stricken from the Navy list 20 December 1971. Since 30 August 1972 the LIONFISH is preserved at Battleship Cove, Fall River, MA., and is open to the public. LIONFISH received one battle star for World War II service. The photos below were taken by me on August 21, 2010, during a visit to the USS LIONFISH museum at Battleship Cove, Fall River, MA.